"He turned Florida from a limp peninsula to a virile member... of the U.S. economy." 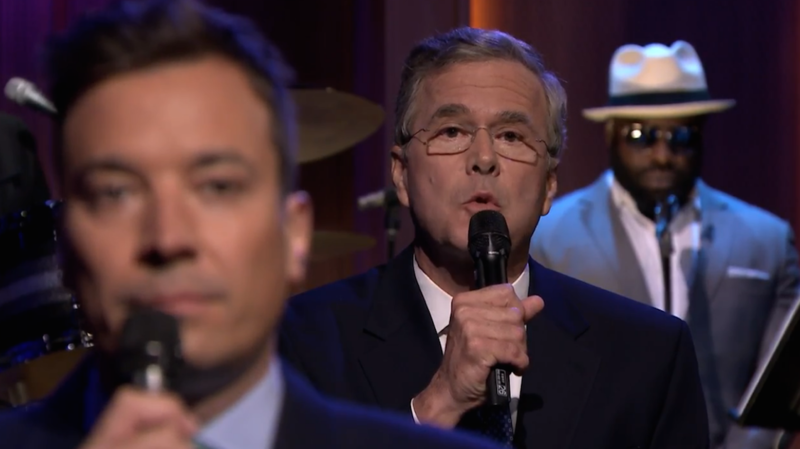 Newly announced GOP candidate Jeb Bush stopped by The Tonight Show With Jimmy Fallon Tuesday evening for an interview, but not before the show’s latest installment of the popular Slow Jam the News segment. The 2016 hopeful, who fancies himself Hispanic, even whipped out some of those his bilingual skills he’s become known for—briefly laying out his thoughts on immigration en Español. Politicians and media types have been regulars on the Slow Jam circuit, with a list of notables that includes President Barack Obama, former GOP presidential candidate Mitt Romney, suspended NBC News anchor Brian Williams and Gov. Chris Christie. Watch the clip, courtesy of NBC.